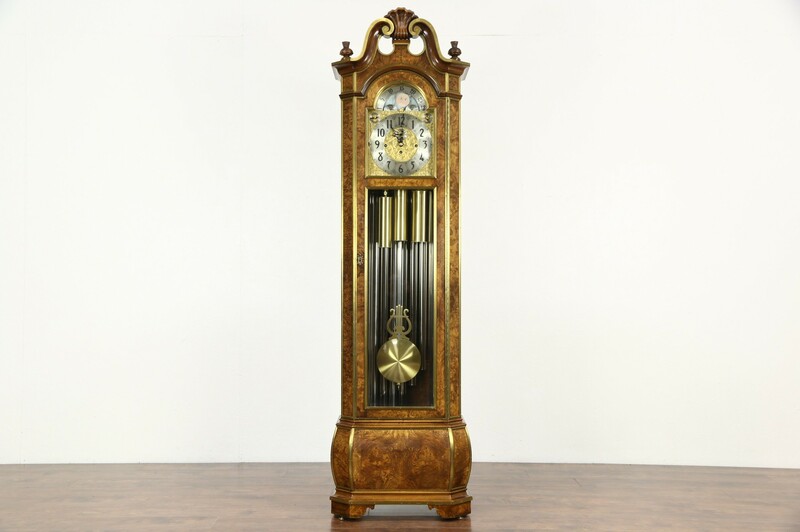 A long case or grandfather clock from about 1980 is "The Clock Model 250" signed by America's finest maker, "Herschede." This is probably their finest clock built before closing in 1983, and was originally sold by the Chicago Clock Co.
Nine resonant tubular chimes play the familiar Westminster melody on each quarter hour and also count the hour. A lever also chooses Whittington or Canterbury tunes, and chime or silent. The gold plated filigree dial is impeccable on this American made vintage luxury clock, which has a hand painted moon dial as well. The signed brass movement has machined and polished brass plates, it keeps excellent time and runs for a week on a winding. The olive ash burl case is lavishly trimmed with brass mounts and has a superb original finish. Glass panes are beveled and the shell crest is deeply carved. Measurements are 25" wide, 15" deep and 88" tall.